Most people who have chicken tractors love the fact that every time they reposition it they know their chickens are all too willing to trim the grass and nourish the soil beneath them, after all, many people know that a chicken tractor is your garden's best friend. Moving a chicken tractor isn’t quite as difficult as rocket science or playing Rachmaninoff, but that doesn’t mean it’s totally without its dangers. It’s important that you understand the small risks involved when moving a chicken tractor, just to ensure that you and your chickens stay safe. Here are a few handy tips to help you cart your chicken tractor around the backyard. Position yourself on the side of the chicken tractor where it is designed to be moved from. Some tractors, like the Taj Mahal, have beautiful wooden handles for you to hold onto while moving it. Bend with you knees and keep your back straight. Grasp onto the handles of the tractor firmly. Lift with your legs and maintain strong posture. Hold the tractor for a moment to ensure the weight is manageable. If the chicken tractor is too heavy, place it back down and find assistance- do not attempt to move it by yourself. Slowly pull the chicken tractor towards yourself, taking little steps backyards. Ensure that you’ve cleared a path prior to moving the chicken tractor. Gradually guide the chicken tractor towards it’s new position. Once the chicken tractor is in the right position, bend with your knees and place it back on the ground. As I mentioned earlier, moving a chicken tractor isn’t the most difficult thing in the world, but it is important that you do it correctly, otherwise you could damage your back, your chickens or the tractor itself. Where Do I Put The Chickens? When moving a chicken tractor it isn’t always safe to leave the chickens in the coop. It is probably best to let your chickens free-range for a few minutes while you move the tractor- just to be sure you don’t accidentally crush any of their delicate little feet. If you don’t feel comfortable letting your chickens free-range you can always put your chickens inside in a room with a tiled surface, like a laundry or bathroom- the tiles are important because it is likely that you’ll need to clean up some chicken droppings. Some people feel very comfortable moving their chicken tractors with their chickens inside the enclosure. It is possible to do this safely but it’s something that you’ll only be able to develop with experience. One trick is to place some feed on side of the coop, which should help keep your girls out of the way, as you drag your chicken tractor into its new position. Additionally, it might be a good idea to have an extra pair of hands and eyes at the ready just in case some of your cheeky chooks try and escape from the coop. Moving your chicken tractor can be an easy, safe and sometimes even a fun chore, so long as you are understand the basics of keeping everyone and everything safe. 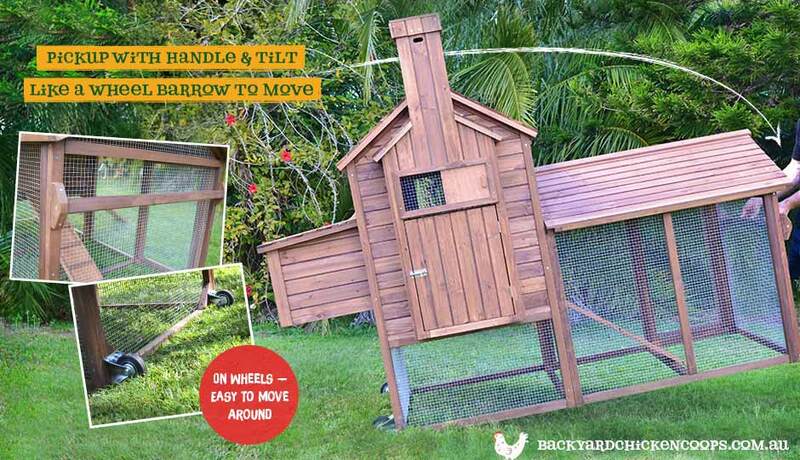 If you are looking for a chicken tractor, why not check out our excellent Taj Mahal, as well as our other chicken coops, such as the Penthouse and Mansion.